In this volume, John Warner grapples with one of Jean-Jacques Rousseauâs chief preoccupations: the problem of self-interest implicit in all social relationships. Not only did Rousseau never solve this problem, Warner argues, but he also believed it was fundamentally unsolvableâthat social relationships could never restore wholeness to a self-interested human being. This engaging study is founded on two basic but important questions: what do we want out of human relationships, and are we able to achieve what we are after? 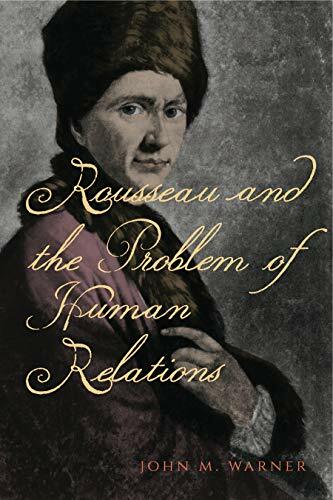 Warner traces his answers through the contours of Rousseauâs thought on three distinct types of relationshipsâsexual love, friendship, and civil or political associationâas well as alternate interpretations of Rousseau, such as that of the neo-Kantian Rawlsian school. The result is an insightful exploration of the way Rousseau inspires readers to imbue social relations with purpose and meaning, only to show the impossibility of reaching wholeness through such relationships. While Rousseau may raise our hopes only to dash them, Rousseau and the Problem of Human Relations demonstrates that his ambitious failure offers unexpected insight into the human condition and into the limits of Rousseauâs critical act. About: In this volume, John Warner grapples with one of Jean-Jacques Rousseau’s chief preoccupations: the problem of self-interest implicit in all social relationships.